Contact us for further information or for any business inquiry. 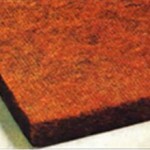 We are leading Mastic Pad Manufactures, DEESA Jolly Bitulex Softboard is processed from cane fiber, mastic pad raw material tested and proven to provide the best resilience.We provide high quality mastic pad which is best in industry. Impregnated with Bitumen in various percentages, it is a perfect base material for expansion joint fillers. The board’s compression and recovery characteristics confirm to the U.K., U.S.A. and Indian Standards much above the required averages. Jolly Board Expansion Joint Filler is manufactured from water-resistant, bitumen impregnated, cane fiber. It is available in a wide range of sizes, both as boards & strips in thicknesses of 10 MM, 12 MM, 18 MM, 19 MM, 25 MM. Jolly Expansion Joint Filler displays excellent resistance to compression, with outstanding recovery characteristics. The fillers are environment-friendly as opposed to the environment destroying thermocole/plastic expansion joint filler. Internal finishes Various other flat works and concrete floors according to the state of the art and local regulations. Department of Transport – London 1986: `specification to highway works, part 3, clause 1015′ B.S. 1142 for Standard Specifications for Expansion Joint Fillers. IS 1838(Part-I) 1983 Standard Test of Expansion Joint Fillers. Duraboard® HD insulation is a high-density board product that offers the same high level of dimensional and surface uniformity as Duraboard LD insulation but provides enhanced compressive strength and a higher modulus of rupture. This higher density is achieved through the inclusion of clay additives during the manufacturing process. Its higher strength makes Duraboard HD insulation particularly well-suited to weight load support applications such as refractory brick backup or for covering larger unsupported spans. For additional information on Duraboard HD, typical applications, product properties, and performance, or to identify the recommended product for your application, see the product information sheet below or contact Deesawala Rubber industries. Refer to the product Material Safety Data Sheet (MSDS) for recommended work practices and other product safety information. HD 100 insulation is a high-density board product that offers the same high level of dimensional and surface uniformity as Duraboard LD insulation but provides enhanced compressive strength and a higher modulus of rupture. This higher density is achieved through the inclusion of clay additives during the manufacturing process. Its higher strength makes Duraboard HD insulation particularly well-suited to weight load support applications such as refractory brick backup or for covering larger unsupported spans..
DEESAWALA RUBBER INDUSTRIES, a leading manufacturers of premium quality rubber products such as Rubber sealing Rings, Rubber Gaskets and other rubber products.